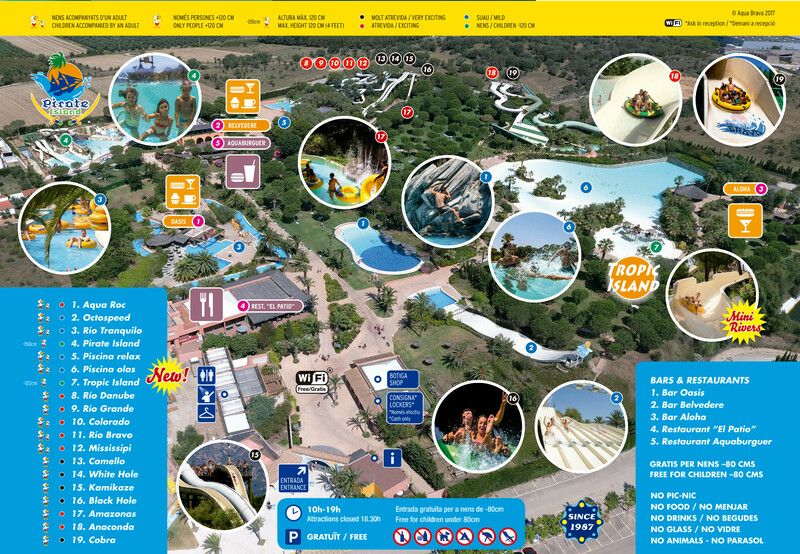 AQUABRAVA is located in Roses, one of the most important tourist villages in the Costa Brava. The region’s name (Costa Brava) means brave or fierce coast, which inspired the creators of the water park to give it this name. At Aquabrava we have the most amazing rides for all ages; it is the best experience you can have with family or friends. Enjoy a terrific refreshing summer’s day in a beautiful tropical setting. You can’t miss the well known WAVE POOL the Europe’s biggest one, and not to forget, THE ANACONDA, a colossal river rafting adventure. Come and try out what the unknown – discover the COBRA, a daring attraction that’ll take your breath away! PIRATE ISLAND is here!! Faithful to our policy of constant renovation, we’re pleased to announce that we’ve completely reformed the children’s area. This legendary attraction with its pirate theme is now twice as big and is an exclusive area of the park for kids, where they’ll find the adults’ attractions at their own scale: Mini slides, Kamikaze... even a WAVE POOL!! An attraction of 3,000 m2, unique in Europe, where the younger ones will live out their own adventure in total safety. You can also find all kinds of facilities: a free car park, very spacious green areas and beautiful vegetation, bars, a self-service restaurant, a pizzeria-burger restaurant, a souvenir shop and a tourist information centre. New attraction COBRA, a daring attraction breath taking! Sitting on a float you will fall into the void on a half-pipe. The Cobra speed will suprise you! For the younger members of the family, there are two children’s areas: Tropic Island and Kids Lagoon with waterfalls, mini-slides, climbing frames…which are the most refreshing and amazing attractions! We have SERVICE OF BUS. AQUABRAVA, AN OASIS FULL OF FUN!